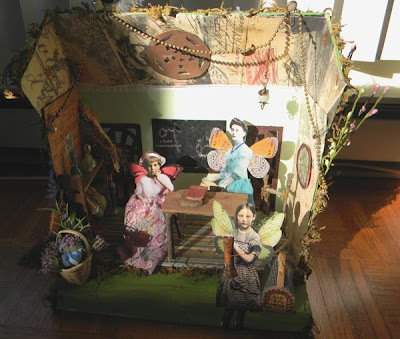 I have another Fairy School to share with you! This time it is from "I Love Crafts" by Eloisa. She has a lovely blog, and makes some gorgeous things! I am sharing two photos, but please stop by and see the rest on her blog. If you click on the photos they will enlarge. 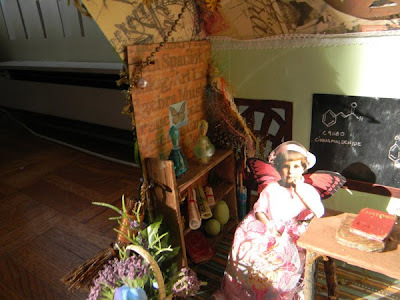 This Fairy School was a family project and is more advanced than the school my fairies go to....if you look on the blackboard they are studying chemistry! Her fairies are so adorable, and her books...*sigh*. There are so many interesting items in this school! Thank you so much for sharing your creativity with us Eloisa! Thank you for introducing me to more human-fairies and fairy fun.Please come and visit me. It is beautiful and artistic, dear Terri! Standing ovation from me. I follow her, too. She is amazing and so is her School House! Love the little one sitting on the chair! Hope you are enjoying your Spring....heard that there were some nasty storms out your way. Terri thank you very much for sharing, this is a stunning piece! I will head over and take a look at her blog! Thank you, Terri for your sweet comment on my blog and for becoming one of my followers. I had to share your lovely blog...I couldn't help myself! I fell in love immediately with the Fairy School tutorials so I knew I had to 'pass them on' to others. I love this fairy share. Beautiful and of all things chemistry? WOW, I won't be teasing those fairly girlie girls! Hugs, friend! wow these are just fabulous.. These faerie schools are just the sweetest creations. I love looking at all of the details. Ohhhh another student of your Faerie School ...how lovely. Thank you for sharing these wonderful blogs with us and the fabulous work of these gals. Have a joy filled day, my friend. Ah, yet another very beautiful fairy house. I still want to make mine but have been too busy. Maybe spring break! Always a delight to visit you, hope you have a wonderful week. What talent! Your sight is full of wonderful eye candy.